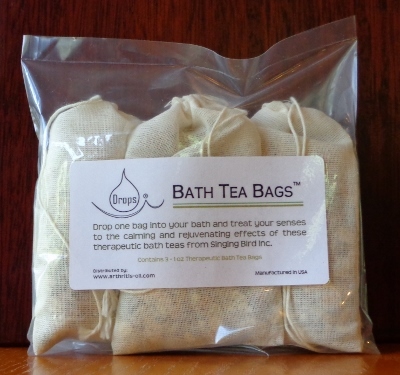 Drops Bath Teas from www.arthritis-oil.com and Singing Bird Inc.
Drops® Bath Tea Bags contain 100% Pure Therapeutic Grade Essential Oils and other Natural Botanicals! Drop one bag into the bath-tub as you start running the water and soak your body as you would for any other bath. Good for dry and irritated skin. Known to soften and sooth dry skin. Known to relax the mind and reduce inflammation. Known to uplift the spirit and reduce muscular spasms. An Ancient Egyptians’ Beauty Oil. Known to increase circulation. Known to help reduce aches, pains and to strengthen bones. Known to work on cellulite also for reducing fungus & eczema. 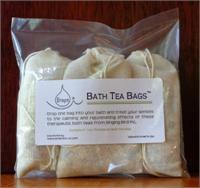 Drops® Bath Tea Bags ~ Contain Natural Herbs, Flowers, Oats and a Blend of 100% Pure Essential Oils. Relax, Rejuvenate and calm down in a warm bath with Drops® Bath Teas! Drops® Derma Vera™ Spray is Soothing and Regenerating. It is excellent for all skin types. Use on wrinkles, dry skin, rashes and more, after bathing, sun tanning and on burns. Drops Lavender Oil, 1/2 oz. Drops® Lavender Oil ~ Keep Drops® Lavender Oil in your first aid kit, a must for every home. Can be used for bruises, burns, insomnia, it’s calming! Lavender is known to relieve stress, tension headaches and more! Drops Sports Oil, 1/2 oz. Drops® Sports Oil ~ Use Oil after a workout! For the active sports. May be used directly as a rub or added to your bath, massage oil or lotions.